One of my goals for my blog this year is to work out a better system for sharing long-term projects. I don’t want to bore you with barely noticeable changes in a project that is progressing slowly. On the other hand, sharing only finished projects doesn’t show the work, time, and even setbacks that go into projects that span months or years; rather, it feeds into that misperception online that other people can do things more quickly or easily than we can. And that’s not a good feeling. In May, I introduced that I was going to start what I’m calling The Hexagon Project. It’s my first attempt at English paper piecing, with a goal of using up scraps as I hand sew a Grandmother’s Flower Garden quilt. Earlier this month, I shared the EPP book I'm using as a reference and my first hand sewn hexagon block. I’m going to post my progress on The Hexagon Project about every month or so. I think having that timeline in mind will keep me motivated, and give me enough time to have an update that’s worth sharing. As I mentioned above, my last update was four weeks ago. In that time, I’ve sewn four additional hexagon blocks. I’ve already chosen the color combinations for quite a few blocks. They’re grouped and ready in my sewing bag, which makes it easy for me to move on to the next block wherever I happen to be. 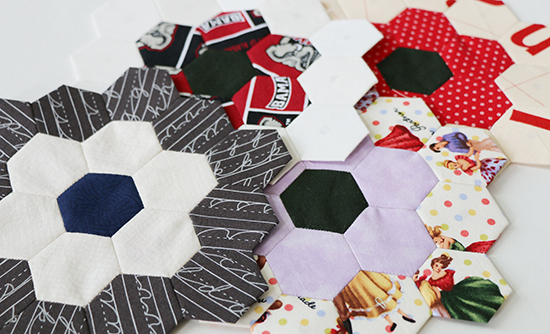 Each hexagon piece needs to be basted onto a template, then the hexies can be sewn together into a block. I have yet to time how long each block takes, but it feels like I’m able to finish one in a relatively short period of time. Although EPP involves a lot of small pieces and some sharp objects, I’ve been able to sew on the go. I find it particularly easy to baste a few blocks during short periods of down time, such as while sitting in a waiting room. I didn’t go so far as to fussy cut most of the hexagons, but I’m mindful of their positioning within each block. I prefer to sew the hexies together at home, where I can lay them out beforehand and leave them undisturbed until they’re sewn in place. You may have noticed the shadow of a circle showing through the hexies on the outer ring of each block. Those pieces still have their templates in place, and what you’re seeing is the hole punched in the center of each template. In order to keep the seams consistent throughout the project, the template is supposed to be removed only after each side of the hexie has been sewn in place. The hexagon blocks measure about 8 5/8 inches (22 cm) across their widest points. My total is now at five completed blocks. I don’t have a final quilt size in mind; I simply want to sew the hexagons that I’ve already cut. I’ll have another update on The Hexagon Project for you in about four weeks. We’ll see if I maintain the same pace of a block each week! Thank you, Andree, and yes, they are addictive! You have got a great start on your hexie project - can't wait to see more!